WE’LL HAVE YOU PARTYING LIKE IT’S 1989! There's no other decade like the 80s. It was THE era of BIG HAIR, BIG HITS and BIG FUN. NEVER ENDING 80s take you back to the best of it all. With a show packed full of the biggest hits by the biggest artists. As the band expertly carve their way through the music of Prince, Madonna, Cyndi Lauper, INXS, Bon Jovi, Michael Jackson, Whitney Houston, as well as so many other giants, the vibe created means that there is nothing else you can to do except sing along and dance! 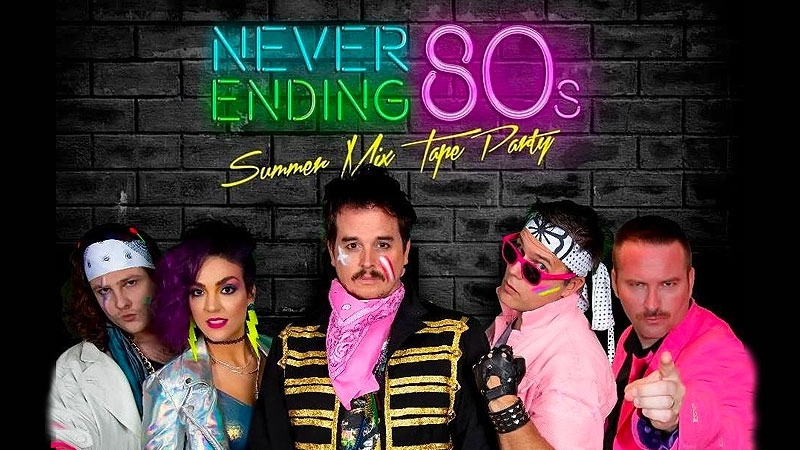 There’s no such thing as ‘fight for your right to party’ with us… So come on… get dressed up in you’re finest 80’s gear and come party NEVER ENDING 80s! FOR SURE..! To purchase tickets to any event you must be a member of this Club or a visitor* to the Club. Please enquire with Reception regarding Disabled or Ambulant seating and Companion Card Concessions. Local residents† who are not members cannot purchase tickets to an event. Please check tickets at time of purchase as refunds or exchanges are not permitted. This Club takes no responsibility for the loss, damage or theft of tickets after purchase. Please ensure you are seated at the correct table and seat as per your ticket to prevent any disruption. These allocations will be enforced and failure to comply will result in ejection from the ticketed event. Video cameras and Audio devices may not be used in the Auditorium. Telephone sales will incur a $3 processing fee. Please check with administration at time of purchase to determine whether the show is reserved or unreserved, seated or standing. Persons attending a show must dress as per the Clubs Dress Regulations. This Club reserves the right to refuse entry to anyone. If entry is refused or a person is asked to leave, no refund will be available. This Club reserves the right to add, withdraw or substitute artists and to vary advertised programs as necessary. *Under the Registered Clubs Act a “Visitor” is an individual who reside outside a radius of 5 kilometres of the Club and may be signed in at any time, following proof of residence. †Local residents (being a person living within a 5 kilometre radius of the Orange Ex-Services’ Club) who are not members of the Club may be signed in as a guest of a member. While on the Clubs premises the guest of the member must remain in the direct company of the member signing them in. When the member leaves, the guest must also leave. Guests are limited to 4 visits to the Club in any calendar year, after which they must apply for membership. ‡A responsible adult in relation to a minor is to be one of the following and must have attained the age of 18 years: a parent; a step parent or guardian; an adult who has parental rights, duties and responsibilities in relation to the minor whilst the minor is on licensed premises or in a public place. As a general rule the person accompanying the child should be at least old enough to be the child’s parent, i.e., 16 year age difference. The following examples do not comply: 19 year old male/female accompanying 17 year old friend or 28 year old sister accompanying 17 year old brother.